Bachelor Buttons…Plant Some This Fall for a Blue, Blue Spring! 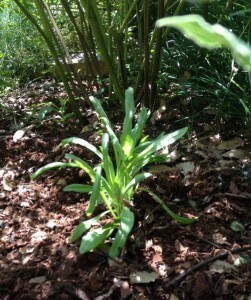 I planted some bachelor buttons, Centaurea cyanus ‘Blue Boy’, in my garden the other day. Usually transplants of these beautiful spring to early summer bloomers are hard to come by until very late fall almost into winter, and I’ve planted them that late with success. This year, though, one of our local growers already has some available! So, if you’re in the Birmingham area, make some room in your garden so you can enjoy the bluest of blues next spring like I do every year along with my roses, foxglove, and snapdragons. To help you understand where they will work best for you, keep in mind that they’ll grow to 3′ and become very full, especially if you cut them back a bit early in the spring. This isn’t absolutely necessary, but I’ve found it keeps mine from sprawling and they still get quite tall. One of my best combinations (Quite by accident! 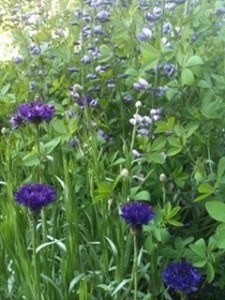 ), and one I’ve repeated, is bachelor button and Baptisia shown here. You may happen upon your own beautiful combinations though. Just remember to give them some sun and don’t baby them too much. Average soil is fine since they are really amazingly tough plants, and only the heat of summer will end the blue wave of carnation like flowers. 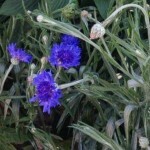 The blue of a bachelor button is simply incomparable – cornflower blue. It was once called “boutonnière flower” because the small, bright blue flowers were once commonly used by bachelors tucked into buttonholes on their suits. It’s also been called “Ragged Robin” and “Cornflower”. Many of you have noticed the bachelor buttons in our sign planter in front of Oak Street Garden Shop each spring. By the time you notice them blooming, it’s too late to plant them. Don’t miss out this year! 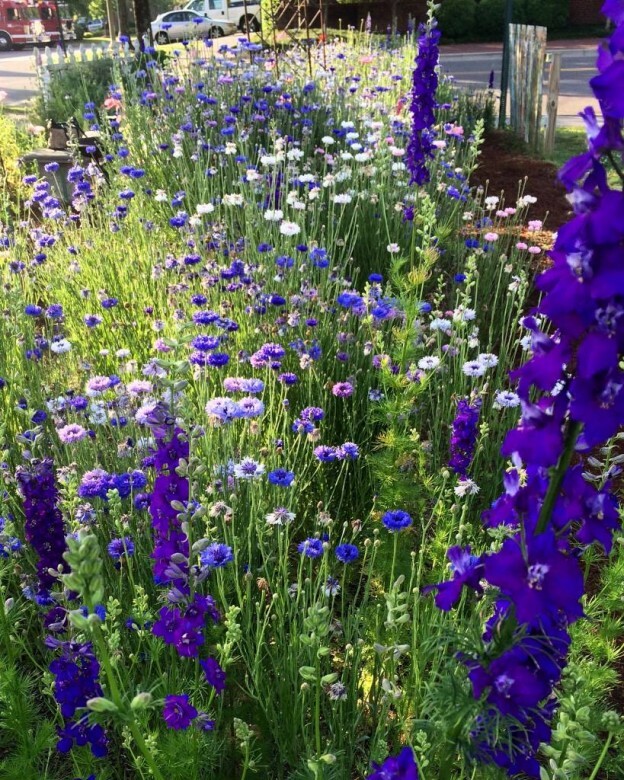 This entry was posted in Annuals, Fall, Flowers, Planting Tips, Spring and tagged bachelor button, blue flowers, centaurea cyanus, flowers to plant in fall, foxglove, snapdragons on September 20, 2014 by Kris Blevons.